Set in an out-of-town entertainment complex, the Space is true to its name both by having a huge amount of space and by creating games about Space. It’s an impressive set up from the moment you arrive, with huge amounts of parking, a massive sign and then, inside, a beautifully kitted-out café with room for tens of people. 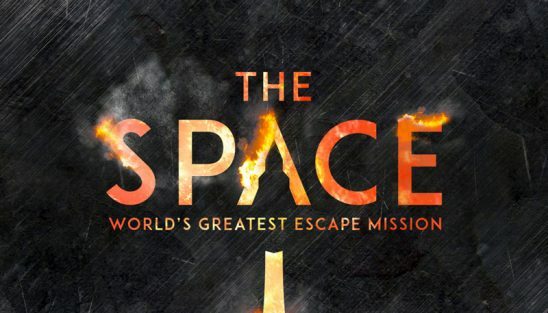 That was a little surprising, because there are only three games at this site: two under “The Space” brand and a third from the same company but under the Escape Room Veghel name. Both games have impressive video briefings, unbelievable sets and a real sense of mission to them. Even better, they tell two sides of the same story, a concept that I love in films and find engaging in escape rooms. The big problem that affects both of them is on the puzzle side: the puzzles were often frustrating, and there was a real lack of signposting – and hence flow – to the game. In spite of that, I’d still strongly encourage enthusiasts to visit this venue. Accept that the flow will frustrate you at times and rely on the GM to offer you guidance, because the rest of the experience is top class. As an aside, we didn’t play the third game because we didn’t realise it was at the same venue, but it’s won awards, so it’s probably worth checking out. I don’t usually count the briefing as part of the game, but this absolutely was. There’s a very professionally created video introduction in a dedicated room where they manage to tell you the story, explain the mission you’re about to undertake and give you the game rules – all that while building up the immersion. The only downside was that the acting wasn’t the best, which took the edge off the show. Still, it was far better than your average intro. That continued with a walk to the launch room, which is in a separate concrete building that you reach across clunking metal grids. It has a gritty industrial feel to it (which, given the history of the site, isn’t entirely surprising) that’s just perfect for the space launch centre theme. Immersion is obviously important in this game, and the décor absolutely backs that up. This is an epic set that few companies would be able to rival. It’s clear they’ve chosen this storyline partly because the building fits it, but they’ve taken that benefit and run with it. It’s a high-tech game too, with plenty of the electronics you might expect in a space mission. What surprised me most was that there were still a fair number of padlocks. A few padlocks in a room wouldn’t usually be worth mentioning, but here they felt so utterly out of place that they really affected the immersion. They didn’t fit naturally in the environment, and one pair of locks in particular really grated. The game didn’t get off to the best start, with one of the early puzzles requiring us to do something that felt a little like we were breaking the room. At least three of us attempted to do the required action and then decided that we shouldn’t. In this room in particular, with such a beautiful set, it’s surprising that they’re encouraging that type of behaviour. It might have been OK if they’d had some signposting that this was what was required but, as with several of the puzzles in this experience, there was nothing beyond inspired guesswork. There are several points at this game where you’ll need to perform searches. It’s worth calling that out because they’re great examples of how searching can be fun or tedious. In one case, we had to search through a whole load of items for relatively little reward. Another required us to search a dark space before we could continue with the game. A third one was a directed search with known targets and a sense of progress which, as we started to understand what was going on, became quite fun. Searching needn’t be something negative for enthusiasts if it’s well-implemented. Going back to that search in the dark, it was painful for a variety of reasons. Firstly, searching isn’t the most fun activity, and searching in the dark makes it less so. Secondly, we didn’t know what the next step was – were we looking for a light switch, an object, some information? Thirdly, it was a big space. It feels unfair to criticise a company for having a large gamespace, but I do think they need to consider the search element carefully if there’s a risk of people spending a lot of time searching fruitlessly. When the puzzles went smoothly, they were good fun, with a couple of genuinely challenging solves and one of my all-time favourite audio-puzzles. All too often, though, they had weak challenges where either it wasn’t obvious that we didn’t have everything we needed or there was a lack of signposting about what we should be doing. This game, though, survived on its sense of exploration and almost excelled in its finale. It was an audacious end to a game that had come close to greatness but had taken a few wrong turns. And sadly, the finale suffered a similar fate, with the end of the game lacking finality and consequently feeling just a little anticlimactic while we waited for the GM to appear. This was a great game with a few too many weaknesses. The sense of mission and exploration were impressive, and the decoration was fantastic (even if they chose to make it dark a little too often), but it was let down by its puzzles: too many required additional guidance, with the result that we were left feeling a bit flat in spite of the theatrical ending. Again, there’s a video briefing to start you off ,with the same qualities as in their first game. I particularly appreciated how they’d interwoven the two videos to help add to the feeling of a single mission between the scenarios. If you’re going to play both sides of this game, I feel it’s most natural to play The Launch first, because you’ll appreciate these introductions more that way round. And, like with the first mission, you’ve got the same walk to the industrial-feeling facility that adds to that immersion. Once inside the game, it’s a very different story. It’s not a particularly engaging start, with very low levels of light and a feeling that you’re going to have to do a fairly thorough search to continue. Worse still, there are lots of sharp edges and pieces of the set you can pull but probably shouldn’t. Worrying about whether you’re going to break a set inevitably breaks the immersion. We did eventually find the focus of that space but, even once we’d worked out what we were meant to do, the lack of player feedback left us stuck for a while. This game didn’t just stumble on the first puzzle: it felt like there was a series of problems before it really got going, with an abundance of red herrings and a couple of weak puzzles quickly following that start. As the game progressed, however, it improved in almost every way. The lighting level increased, the decoration was correspondingly better, and we got to interact with more and more chunky and interesting props. Again, this game has a real sense of mission, with you heading towards your ultimate goal not just by solving puzzles but with an almost relentless journey forward into new spaces. As with The Launch, the sense of discovery and exploration was where this game excelled. And, also like The Launch, there’s a potentially great finale that’s diminished by some of the weaknesses along the way. A confusing puzzle left us frustrated with just too many possible solutions. That was followed up by a physical challenge that I found difficult and other members of the team found next to impossible (not to mention not very safe). I liked the idea, and it was very thematic, but I think they need to adjust the difficulty level so that it’s achievable by all. The finale builds to a crescendo with several stages coming together in quick succession. The final stage of the game sees you complete another thematic action. Ironically given my criticism of the previous stage where it was physically difficult to complete, this was almost too small. In the context of a grand set, it felt like a minuscule thing to do as we all crowded round. I think reversing those two puzzles would give you a better finish and adrenaline rush. It might also be that we’d long since worked out what we needed to do, which made the final stage – which they’ve designed to be extra stressful as time slips away – a lot less daunting. That’s all on The Space – want to read more about other local games? A link will be added here when the summary article is published at the end.